Art Gomez contacted us several months ago to create a website for him – 806 Appliances. He specializes in the sale of new, used, and scratch-and-dented appliances. In addition, he offers appliance haul-away services. 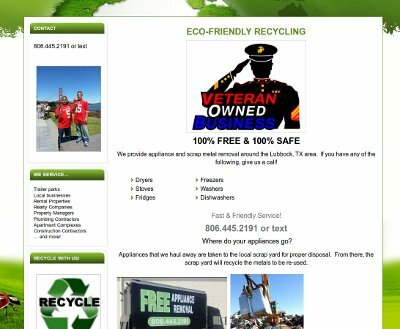 Therefore, Art requested that we create a low-cost website for him that specifically advertised his appliance pick-up and removal services. Art takes pride to ensure that the appliances he picks up are properly sent to the scrap yard so the metals and materials in the appliances are properly recycled and re-used. We appreciate the continued business from Art and hope that we can continue to provide all of his website and graphic design service needs. Art’s website is at 806recycling.com.